Happy May the Fourth Be With You Day! 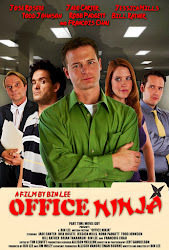 Last week, I had Jade Carter (our hero Tomas from Office Ninja) on my podcast to reminisce about shooting Office Ninja, and getting to know his acting career. Next week, I'll have Jose Rosete, who played Raheem on. Also, I'll be a "celebrity" judge at a stand-up battle royale called Punchline Punchout, hosted by my friend Andy Erikson and Alex Stein. It's tonight 9:15pm at Neon Venus on Melrose. If you like stand up, come on down and say hi!